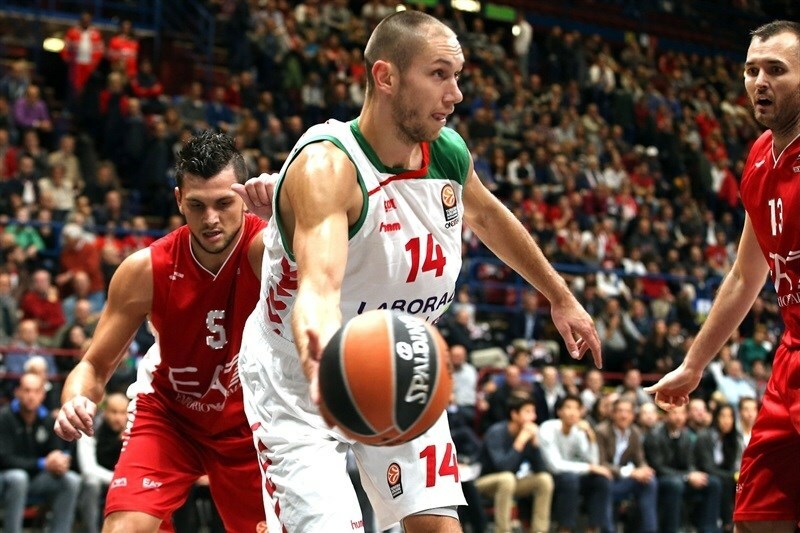 EA7 Emporio Armani Milan nearly wasted a 20-point fourth quarter lead, but held on to beat Laboral Kutxa Vitoria Gasteiz 78-76 to start the 2015-16 Turkish Airlines Euroleague season. 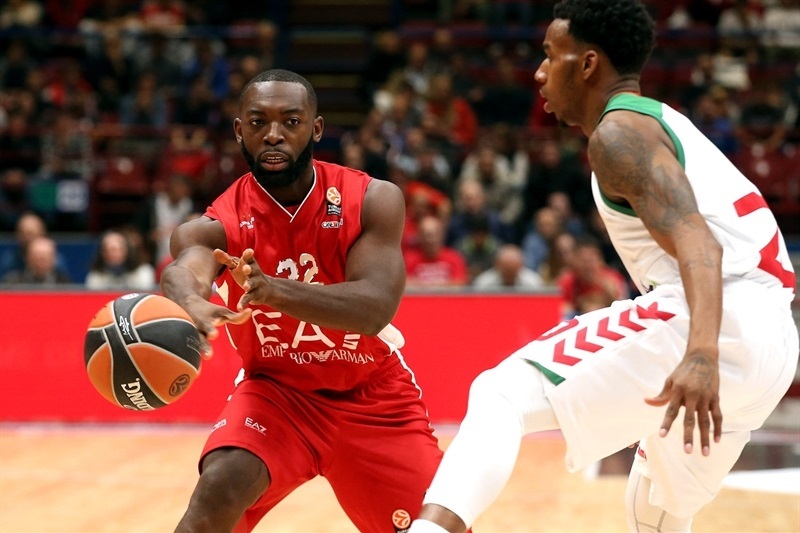 Jamel McLean’s 13 points paced five Milan players in double-figures as the Italian club improved to 1-0 in Group B despite seeing a 20-point cushion shrink to 2 late. Milan made 6 of 6 free throws in the final 32 seconds to secure the victory. 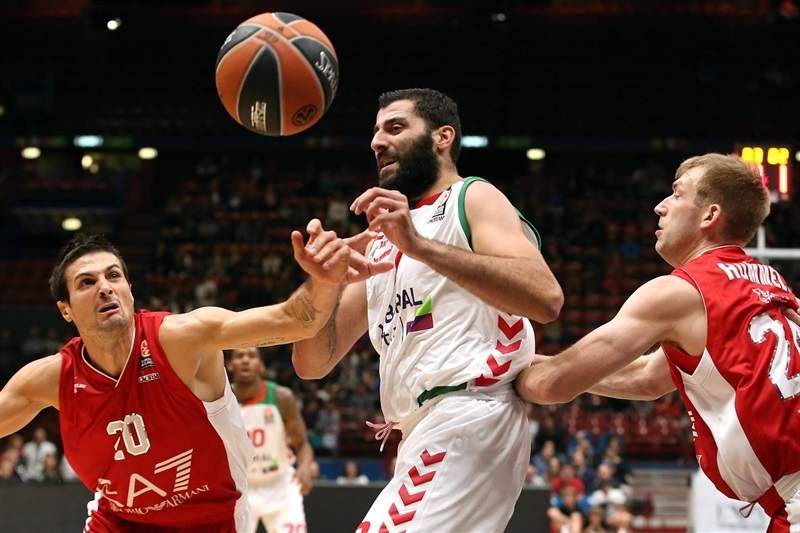 Alessandro Gentile had 12 points, 6 rebounds and 6 assists for the winners, while Krunoslav Simon added 12 points and Charles Jenkins and Robbie Hummel both chipped in 10. 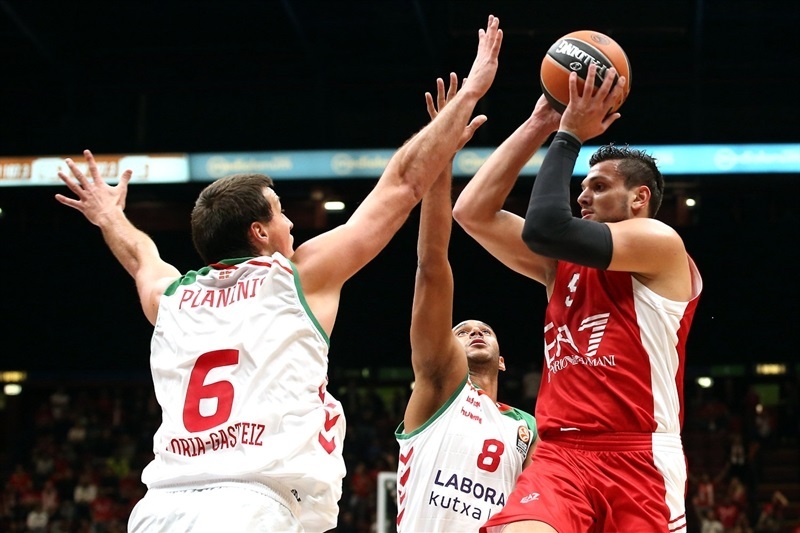 Milan made all of its 21 free throws, while Laboral converted on 15 of 17 (88 percent). Ioannis Bourousis came off the bench for 13 points and 8 rebounds, while Mike Adams had 13 points and 5 assists. Darius Adams also scored 11 points in defeat. 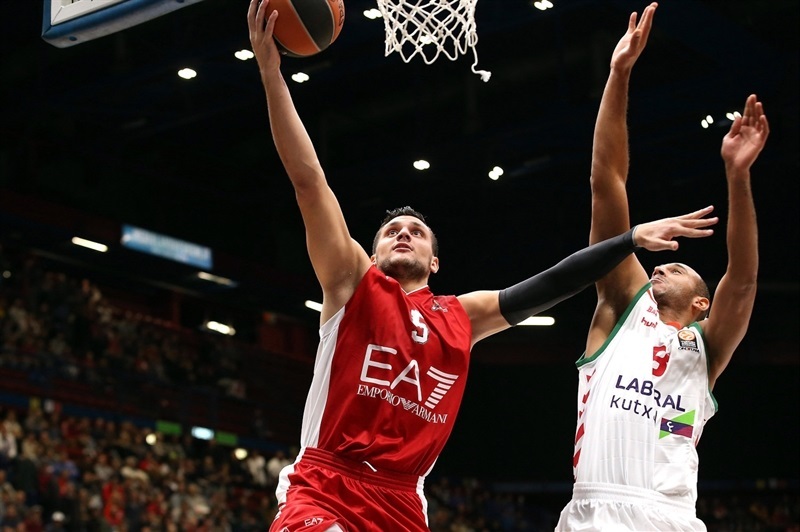 EA7 Emporio Armani Milan’s starting five was Andrea Cinciarini, Charles Jenkins, Gentile, McLean and Milan Macvan, while Laboral sent Adams, Fabien Causeur, Adam Hanga, Kim Tillie and Darko Planinic as the first five. Adams started the game for the guests with a three-pointer. Gentile got the home side on the scoreboard with a driving layup. Laboral struggled with turnovers early, losing three balls and Milan turning them into four points on a Gentile dunk and a layup from Jenkins for a 6-3 lead. Tillie knotted the game with a triple and Causeur’s long ball pushed the Spanish team ahead 8-9. The gap was 8-13 after a jumper from Kristjan Kangur. Gentile knocked down two foul shots and then Hummel’s baseline jumper had Milan to within 12-14. Kangur came back down to tip in a miss before Adams stole a ball and put in a layup to make it 12-19. 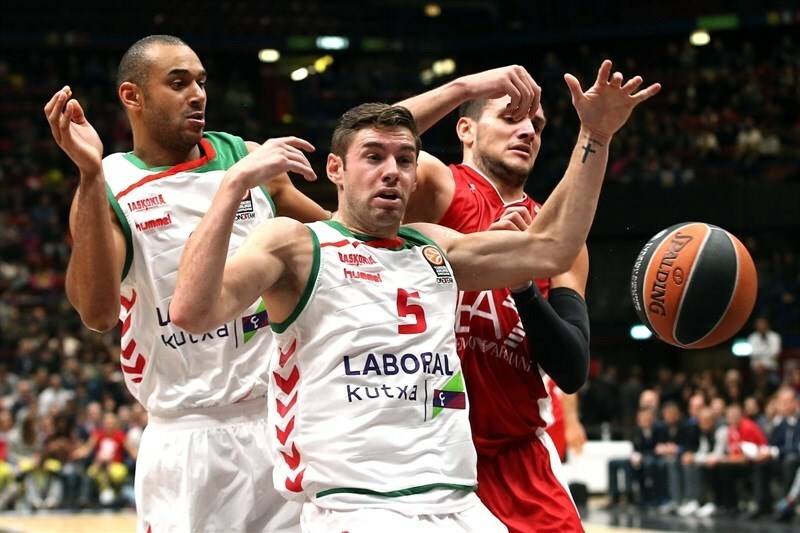 Hummel continued his strong Euroleague debut with a putback and a three-pointer from the right wing as Milan pulled to within 17-21. 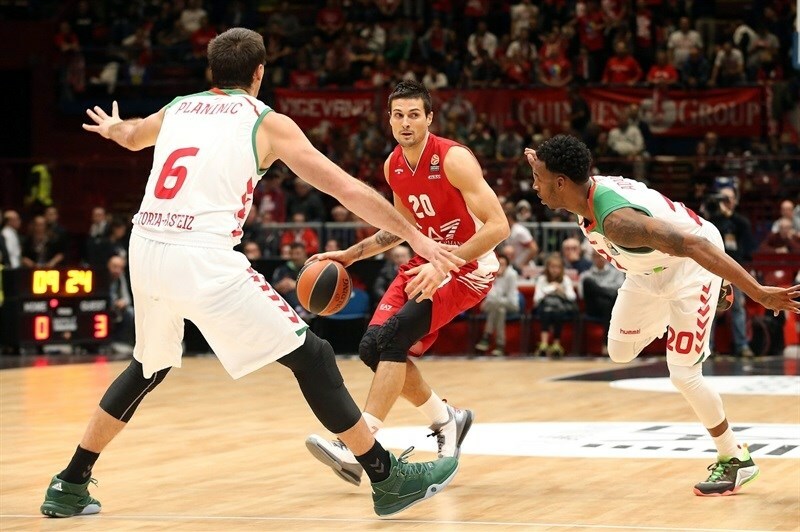 But Laboral scored the final four points of the quarter with James converting a fast break layup and two Bourousis free throws for a 17-23 gap after 10 minutes. 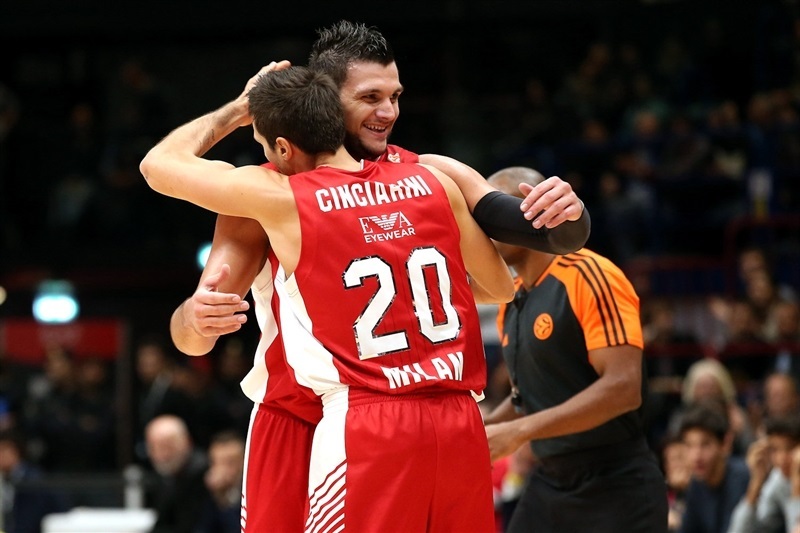 Kuxta scored first in the second quarter as Bourousis found Causeur with a nice pass for an easy layup for 17-25. Simon came off the bench for Milan with a three-pointer and Oliver Lafayette’s jumper trimmed the gap to 22-25 - forcing a Laboral time out. Bourousis was unstoppable in the block as the big Greek center tipped in a miss to re-establish a five-point lead. After Gentile’s layup cut the deficit to one point, Bourousis was at it again, putting back an offensive rebound. And Laboral led 26-31 as Causeur fed Ilimane Diop for an alley-oop. Hummel responded with a three-pointer and then McLean converted a three-point play and two free throws to give Milan a 34-31 advantage. After Planinic converted a three-point play to knot the game, McLean and Lafayette both made two foul shots to make it 38-34. James provided for the half-time score with a jumper for 38-36. Gentile started the second half with a driving layup and the hosts turned defense into offense with a dunk by McLean. After four Macvan points, Gentile dribbled around the Laboral defense for a layup and a 48-36 advantage. After Laboral missed its first three shots and committed four turnovers, the guests finally scored in the second half on James’ layup with 6:13 minutes left. Diop’s foul line jumper trimmed the deficit to single digits at 48-40. But Jenkins nailed a three-pointer and followed a Macvan jumper with another three-pointer for a 56-42 lead and a Laboral time out. Simon came out of the break with a three-pointer from the corner to build the advantage to 59-42. 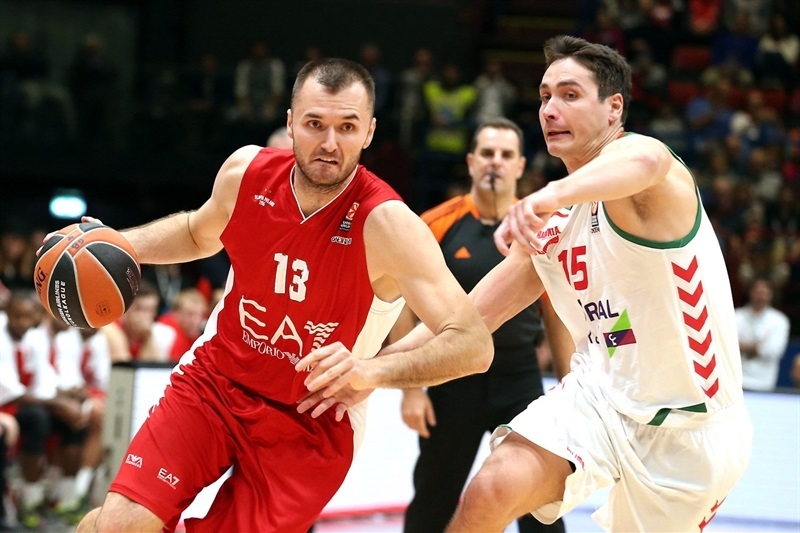 Adams and Blazic were able to score for the guests but Stanko Barac’s baseline jumper had EA7 Emporio Armani Milan up 61-46 after 30 minutes. After Jenkins opened the fourth quarter with a jumper, James and Planinic scored to trim the deficit to 63-50. 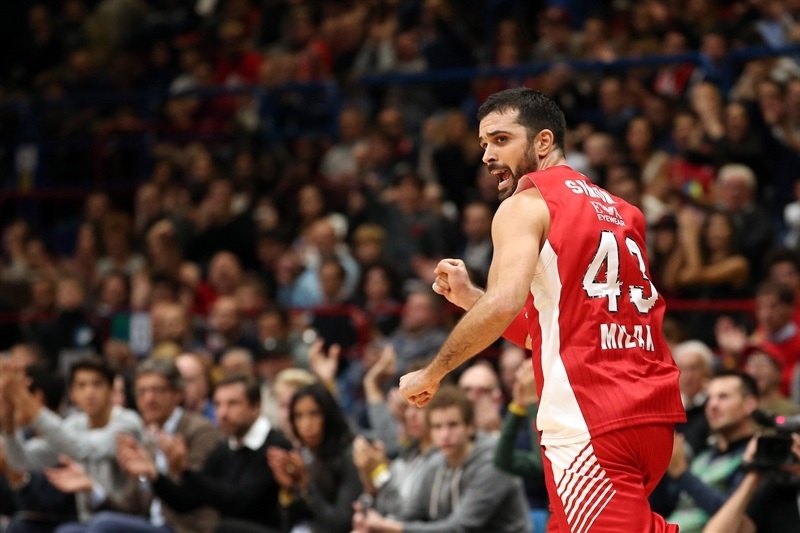 Gentile came up with some fine passing, finding Barac inside and Cinciarini for a corner three and Simon’s jumper in the lane pushed the Milan cushion to 70-50 with just 4:15 minutes left to play. Laboral refused to give up as James started the comeback with a three-pointer. 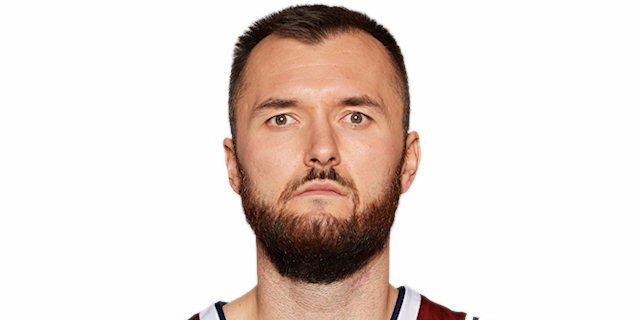 James assisted on a fast break layup by Blazic and Hanga knocked down a triple after a block to cut the gap to 70-60 with 2:39 minutes remaining. 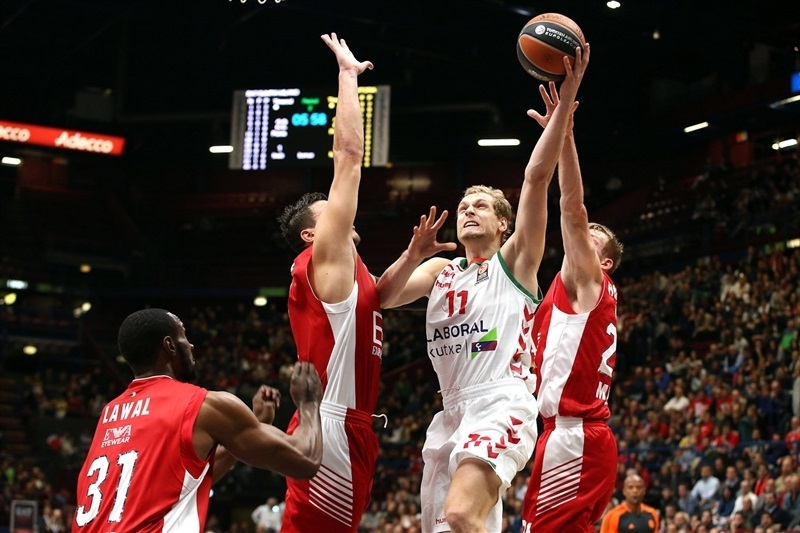 Blazic followed with a three-pointer of his own to make it 70-63. McLean stopped the 0-13 Laboral run but Blazic came up with four free throws and James’ steal and layup made it a one-possession game at 72-69 with 41 seconds to play. Laboral sent Simon to the line and the Croatian made both of his foul shots. Bourousis again made it a three-point game with a lay-up. After Lafayette added two free throws with 15 seconds remaining, Bourousis went 2-for-2 from the line as well with 7.3 seconds left. Laboral nearly stole the in-bounds pass but it ended up going out of bounds. Lafayette would end up icing the victory with his free throws with 3.9 seconds on the clock. But Bourousis drained a three-pointer at the buzzer in hopes of possibly impacting point difference later in the competition. "It’s hard to understand why we stopped playing. We had a big chance to win by more than 20, but we stopped attacking when they pressed us. But this is an important message for us in the future. The game is 40 minutes and we cannot stop before that." "We were confused by their press defense. We had a big lead, still we are playing with a lot of differences in our game. 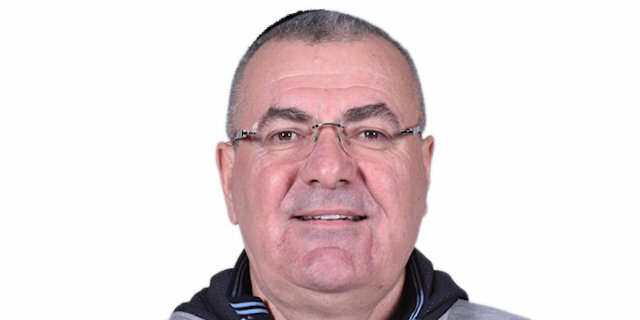 We have to fix it before the next two games because the teams are getting stronger, Efes and Olympiacos, so we have to get ready for those two teams. We had good moments, but we had too many turnovers when they started pressing us, so that’s one of the key things for us right now. "